Tamilnadu HSC +1 Revaluation 2019: After checking your plus one +1 public results online, you must be looking for revaluation, if you are not satisfied with your marks. The Tamilnadu Directorate of Examination Board has come up with some conditions before applying for the 11th revaluation. You must be aware of the rule for the applying for +1 public exam revaluation, retotalling and scan copy download. 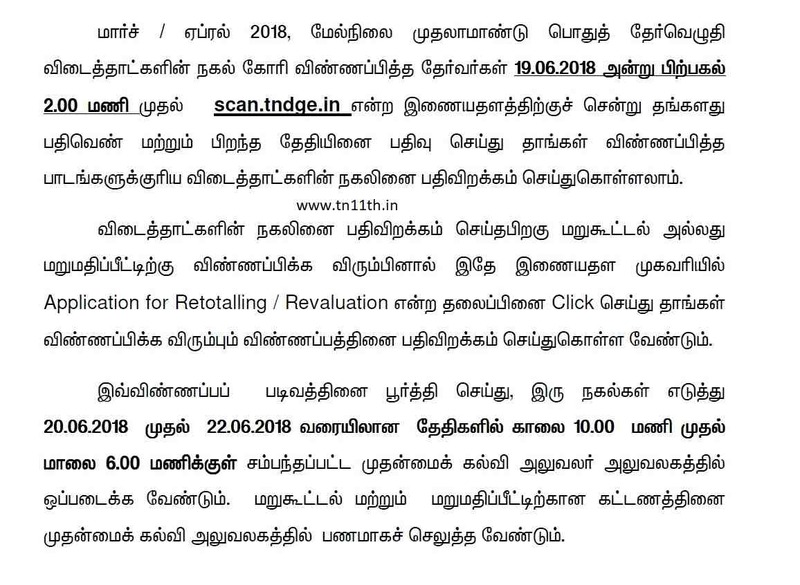 The TNDGE had conducted the 11th public examination March 2019 at various exam centres in Tamil Nadu. This year is the first ever public exam that is organized for 11th standard. There was much confusion over 11th syllabus and marks allocation, as there is no blueprint released. All students were finding difficulties to face public exams without proper syllabus and blueprint. However, all the students had participated in the public exams and got the results. All the general and private candidates are eligible to apply for the answer sheet scan copy. 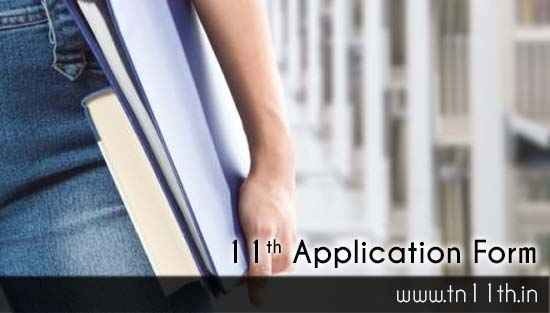 School students can apply through their school where they had studied 11th class. All the private candidates can approach the exam centres where they appeared for the public exam. As of now you can only apply for the scan copy. Once you received scan copy, you will be given chance to apply for HSC 1st year revaluation or retotalling of answer paper. 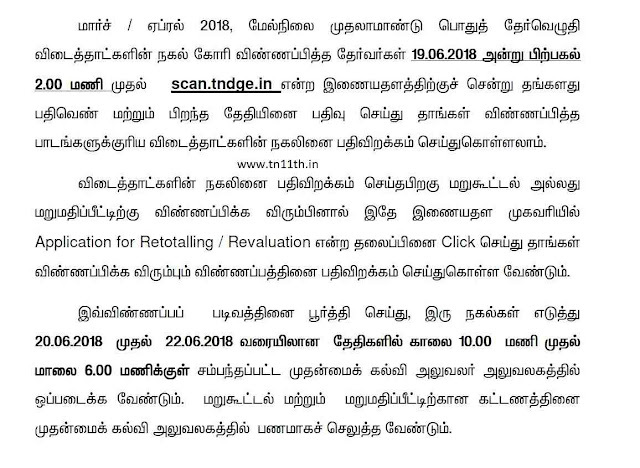 You can apply for scan copy on May 2019. You need to pay application fee in cash. In order to apply for revaluation, you must have applied and received your scan copy. If you do not apply for scan copy, you will not be allowed to apply for revaluation. After you have successfully applied for scan copy, you will be given an acknowledgement card with number. You need to enter the acknowledgment number and date of birth to download your answer sheet scan copy online. You can download the san copy online. The date and website details will be informed later. All the students those who have got fail marks and those who have not attended public exam in march, can apply for attempt / special supplementary exam in July. The 11th attempt will start from June 2019. When will they release the scan copy? When can the scan copies be downloaded for Std XI TN State board students? Kindly update the same ..
From which website can I download the scan copy? And from our school or by myself? For 11th please say date for getting scan copy. does any one get the scanned copy?? When will release 11th scan copy? Please tell the date. please let me know when 11th scan document will be published. Tomorrow at 2 p.m we can download the scan copy. Till 22nd we have time to apply for revaluation at the CEO office. Just got the news from a govt school staff. Authentic news. Download at 2p.m. on 19th June. Three days time for revaluation. Today it vl be available guys..i read in newspaper juz nw. சென்னை: 'பிளஸ் 1 விடைத்தாள் நகல் கேட்டவர்கள், இன்று(ஜூன் 19) பிற்பகல் முதல்,scan.tndge.in என்ற இணையதளத்தில் பதிவிறக்கம் செய்து கொள்ளலாம்' என, அரசு தேர்வுத்துறை அறிவித்துள்ளது. விடைத்தாள் நகல் பெற்றவர்கள், அதை ஆய்வு செய்த பின், மறுகூட்டலோ, மறுமதிப்பீடோ தேவைப்பட்டால், அதே இணையதளத்தில் உள்ள, விண்ணப்பங்களை பதிவிறக்கம் செய்யலாம். பூர்த்தி செய்யப்பட்ட விண்ணப்பங்களை, ஜூன், 20 முதல், 22க்குள், முதன்மை கல்வி அதிகாரி அலுவலகத்தில் சமர்ப்பிக்க வேண்டும் என, தேர்வுத்துறை தெரிவித்துள்ளது. Let me know whether the date for applying revaluation for +1 2018 has been extended or not. where and where to check the revaluation result ?